You are here: Home / children / ZED! This is Zed’s second trip to us, he first came in January 2009. 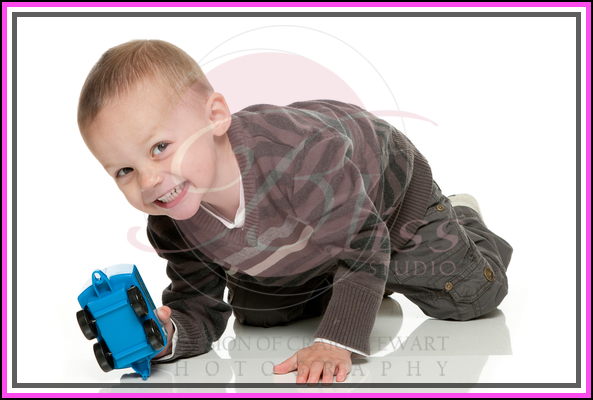 He loves his trains, particularly crashing them! Check out his video below. You can see from his very cheeky smile that doing children photography can result in having to let kids get up to a bit of mischief occasionally. The results though are usually worth it! These photographs make you want to jump in with him and play trains as well. Bliss Studio has a whole bunch of toys for children to play with while having their family portrait. No matter their taste or age we have something for everyone. If that doesn’t work we always have other staff members willing to make fools of themselves to ensure we get THE photo. With smiles like that we will have you back anytime Zed. If your child has a favourite toy please feel free to bring it in to your children portrait session. Anything that will make them relax, smile and have fun is always appreciated by the children’s photographer’s. Baby photos are always cute when they have a special toy or outfit to have a photograph with as well. We are happy for you to bring in a suitcase full of ideas! !